NICK Bradley, what are you doing here? BRAD Busy, busy busy, Big Guy. I’ve got a major media blitz going on regading our upcoming mission. 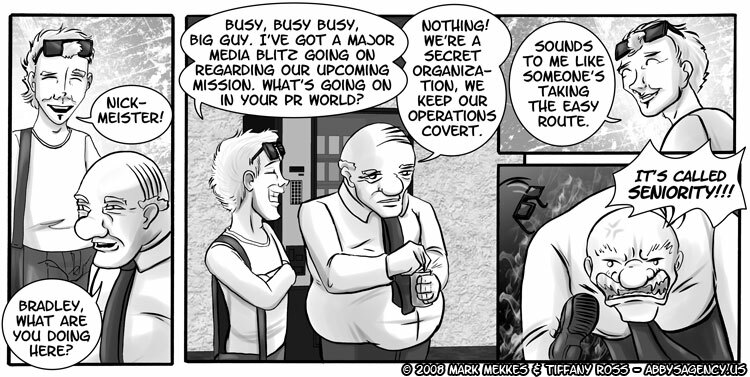 What’s going on in your PR world? NICK Nothing! We’re a secret organization, we keep our operatons covert. BRAD Sounds to me like someone’s taking the easy route. So.. Nick is the head of the PR Department!? Yes, he’s the head of publicity and public relations of a secret organization. Could there be a more cushy job? That certainly explains why he hasn’t been fired yet.